WASHINGTON, DC, March 1, 2012 (ENS) – The Nuclear Energy Institute and the National Mining Association, Monday filed a federal lawsuit seeking to reverse the Obama administration’s withdrawal of one million acres of public land in Arizona from uranium mining for 20 years. Interior Secretary Ken Salazar announced the continuation of the government’s moratorium on new hardrock uranium mining claims on land surrounding the Grand Canyon on January 9. The public land at issue is not within the Grand Canyon National Park or the buffer zone protecting the national park. The lawsuit contends that the land withdrawal is an “arbitrary agency action” under the Administrative Procedure Act, and that it fails to comply with the National Environmental Policy Act by failing to take the “hard look” at the withdrawal’s consequences that the U.S. Supreme Court required in a unanimous 1989 decision. “The proposed land withdrawal is not justified by information in the Interior Department’s environmental assessment. The proposed land withdrawal is designed to protect against situations and circumstances that no longer exist,” said Richard Myers, Nuclear Energy Institute vice president for policy development, planning and supplier programs. The affected lands are situated in three areas, all in the vicinity of the Grand Canyon or Grand Canyon National Park, in Mohave and Coconino counties of northern Arizona. Approximately 3,200 mining claims are currently located in the withdrawal areas. The Public Land Order to withdraw these acres for 20 years from new mining claims and sites under the 1872 Mining Law, subject to valid existing rights, is authorized by the Federal Land Policy and Management Act. The withdrawal does not prohibit previously approved uranium mining, new projects that could be approved on claims and sites with valid existing rights. Without the withdrawal, there could be 30 uranium mines in the area over the next 20 years, including the four that are currently approved, with as many as six operating at one time, according to the Department of the Interior’s Final Environmental Impact Statement, FEIS. Uranium resources in the Arizona Strip represent some of the highest-grade ores located in the United States. These uranium resources are higher grade than 85 percent of the world’s uranium resources, according to the Interior Department’s FEIS. “These resources represent as much as 375 million pounds of uranium, approximately 40 percent of U.S. reserves and more than seven times current U.S. annual demand,” the Nuclear Energy Institute said in a statement announcing the lawsuit. 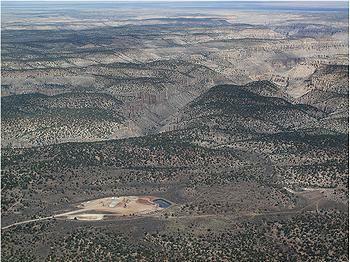 “The 40% value was based on comparing two resource assessments – (1) one conducted by the USGS that provided an estimate of the uranium resource endowment in the Grand Canyon region and (2) another compiled by the U.S. Energy Information Agency (EIA) for the estimated uranium reserve for the entire United States,” explains Van Gosen. “Endowment refers to the in-place mineral resource, some of which is discovered, and the remainder that is predicted to occur based on favorable geologic conditions; much of the endowment resource is not yet proven or discovered,” writes Van Gosen. On behalf of the nuclear industry, Myers argues that the world needs the uranium that would be extracted from the lands withdrawn by the Interior Department because the world’s nuclear power plants currently consume more uranium than is produced. “Current worldwide uranium demand is roughly 180 million pounds per year, but worldwide production is approximately 140 million pounds per year,” he said. “The balance comes from secondary sources of supply, including inventories held by the U.S. and Russian governments. U.S. uranium production in 2010 was approximately four million pounds.